An inspired second-half showing saw Liverpool beat Chelsea 2-0, with quick-fire strikes from Sadio Mane and Mohamed Salah sending Jurgen Klopp's men back top of the Premier League table. 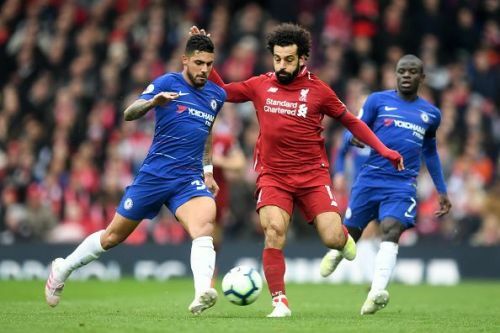 A frustrating first-half was almost immediately forgotten after two goals in three minutes saw Maurizio Sarri's men stunned at Anfield - as the Reds continue to intensify pressure on defending champions Manchester City, who beat Crystal Palace in the day's earlier kick-off. Eden Hazard hit the post and squandered another promising opportunity minutes later, as Champions League-chasing Chelsea looked for an immediate response - but it proved futile. It marked the first time the Blues' talisman has missed two clear-cut goalscoring chances in a league match since December 2017, coming at precisely the time they needed the Belgian forward to step up most. 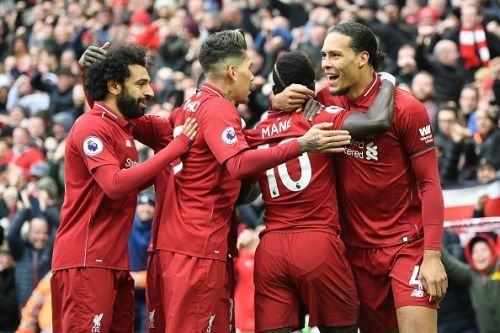 Instead, Liverpool held firm for their clean sheet of the campaign while returning to the summit with four matches and a league title to play for. Cardiff, relegated Huddersfield, Newcastle and Wolves: win all of their remaining fixtures and there's a good chance they'll be crowned champions as City's strenuous schedule looms large. With all of that in mind, here's a look at five hits and flops from a memorable clash at Anfield. Emerson, in a similar vein to how Marcos Alonso used to coast through games, showed with his display on this occasion just how match stats can be deceiving. Alonso's poor form and unreliability on defence means the Italian has been given an extended opportunity to stake a starting berth at left-back, but the Italian didn't do much on this occasion to justify why he's considerably better. With four tackles and clearances to accompany two interceptions, he committed one foul but you wouldn't see these stats and believe he'd be a flop. He was. Allowing former teammate Salah get the better of him far too often, he should've done his homework and learned from other defenders who have isolated Salah well - Lucas Digne and Toby Alderweireld for instance last month. Salah knew he could get the better of his former teammate and did so at will, weaving past him and even when he decided to approach the Egyptian, he did so cautiously. That in itself is a double-edged sword: come and pressure, you run the risk of committing fouls in dangerous areas of the pitch. Let him accelerate towards you, there's always a chance he decides to let fly from a distance or create a chance for a teammate in space, which ultimately happened. For the Reds' first goal, he gets out-muscled after Firmino and Salah combine in the box. No matter which way you look at it, he should be stronger there, stay upright and do his utmost to clear his lines! As for their quick-fire second, van Dijk's searching pass was an effective one but it reflects poorly on Emerson as he lacked the awareness and positional awareness to adjust accordingly once Salah controlled the ball. Within two, three touches of the ball, he left the fullback in his wake and he needs to decide what to do quicker - either stick tighter and cut off a potential shot, or commit to a tackle and force him into a more uncomfortable situation, even if the challenge isn't a successful one.